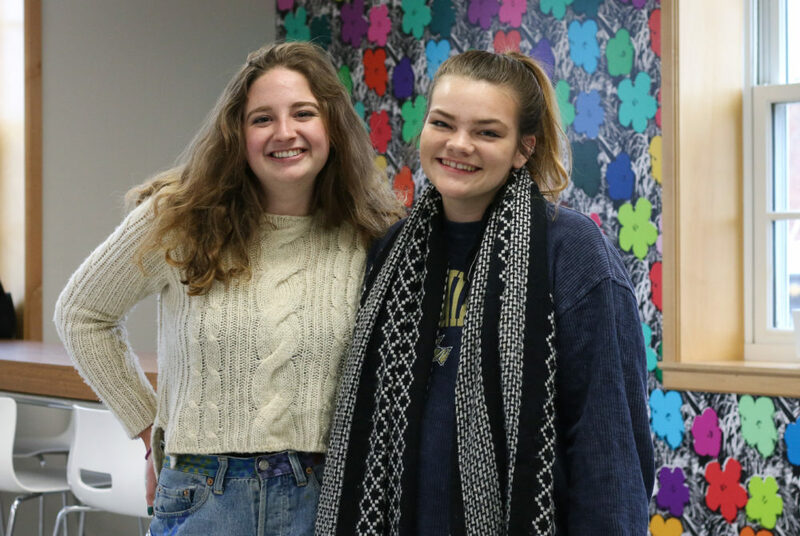 Freshmen Eliza Durkee-Neuman and Heather Robinson are the co-coordinators for GWComposting on the Vern. Residents of the Mount Vernon Campus can now compost their food scraps. The GWComposting program – formerly dubbed Colonial Composting – expanded to the Vern last Friday after operating for two semesters on the Foggy Bottom Campus. Students involved in the program said bringing composting to the Vern integrates GW’s two campuses and makes sustainable practices more convenient for students who cannot easily transport their food scraps to Kogan Plaza every week. The pilot program launched last spring semester and has collected nearly two tons of waste that would normally go into landfills, according to a tweet last week from the Office of Sustainability. Composting on the Vern will run every Friday in Ames Hall from 8:30 a.m. to 12:30 p.m., students said. Sophomore Jonathan Kvilhaug, an intern in the Office of Sustainability who manages GWComposting, said the office, which took over the programming from the Division of Operations this summer, was interested in expanding the program after students suggested it be offered on the Mount Vernon Campus as well. “A lot of the volunteers and participants lived on the Mount Vernon campus and even though they were willing to travel down to Foggy Bottom to bring compost or volunteer, they’d expressed an interest in eventually establishing an additional site there,” Kvilhaug said. He said the program will help educate freshmen about composting and make them more likely to compost throughout their career at GW when they move to Foggy Bottom. “We want to have something on the campus that can be a fixture to encourage people to become familiar with sustainability,” he said. Freshman Heather Robinson, a co-coordinator for GWComposting on the Vern, said residents expressed interest in composting but were inconvenienced by the setup on Foggy Bottom. She said the “proximity” of the new location will allow them to be more involved in the program. Robinson said the programs on both the Foggy Bottom and Mount Vernon campuses will operate the same way. Students will be able to dispose of items like frozen food waste, soiled paper and sweetgreen containers. Junior Colin O’Brien, who helped launch GWComposting last spring, said students involved in the program “always” intended to expand the initiative, and the new site will allow more students to participate in composting practices. “I’m very happy that students on both campuses can now participate in GWComposting,” O’Brien said in an email. This article appeared in the January 24, 2019 issue of the Hatchet.